I liked to call it “Pirate Oatmeal”, both because of the fruit and because I sometimes added rum at the end of the cooking time. (Pirates of the Caribbean was big back then, and it seemed like the thing to do.) No one else seemed to like the name, so I kept thinking. The names I came up with weren’t any better. I think I even tried “Oat Risotto” out on the owner at one point as a way to hint at the cooking process and upscale nature of the oatmeal. Thankfully, he shot that one down, too. I still call it Pirate Oatmeal when the need for a name arises. However, it’s never fit all that well, so I’ve decided to dub it “The Tiger’s Oatmeal” in honor of the launch of this site. I think that both captures the exotic twist of the spices and fruit and the way this oatmeal invigorates you for the day ahead. 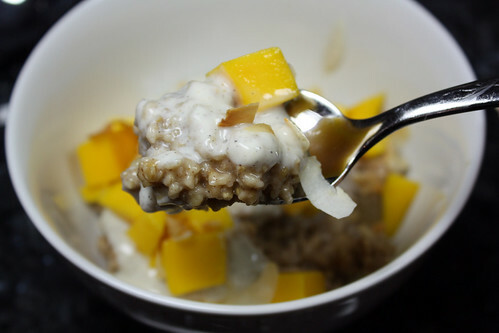 The Cardamom Yogurt was derived from a recipe for Mango with Yogurt in Sundays at Moosewood Restaurant, and my oatmeal evolved from Alton Brown’s delicious Steel Cut Oatmeal, but both diverged from the original recipes long ago. One of the great things about cooking the same thing for a crowd week after week is that you learn how to make it in your sleep and you figure out all sorts of tricks for increasing efficiency and serving things to a large group over an extended period of time. One of the great things about writing for a food blog is that you get to share those tricks with other people. 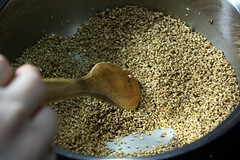 Here’s what I’ve learned about making steel-cut oatmeal over the years. 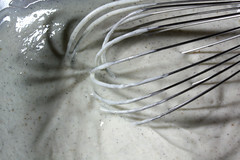 The yogurt’s quick and easy: whisk it with the maple syrup and cardamom until smooth. Both the syrup and cardamom should be done to taste, so make sure you start with a conservative amount of both and work up from there. For instance, I like a lot of spice in anything spiced, so I use eight times as much cardamom as the original recipe. I think it tastes better that way, but a few people out there would disagree, I’m sure. The yogurt is best made the night before you want to use it. This gives the cardamom time to disperse its flavor throughout the yogurt. If you’re making it the morning of, though, you can add more cardamom so that it will have more flavor right away. I usually make an entire large container of yogurt at a time and put it back into the fridge, making sure to clearly label that it’s cardamom yogurt, not plain. It’s great to put on top of all sorts of fruit, with or without oatmeal, and I find if I have it in the fridge, it always gets used. It helps, of course, that yogurt has an excellent shelf life. 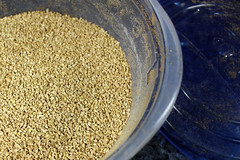 Here is another part of the recipe that can be done the night ahead. 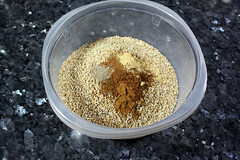 I usually put the oatmeal in a sealable container and shake it up with the spices (and any dried fruit). 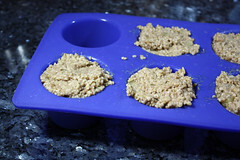 It can be used right away, left on the counter overnight, or put away in the cupboard until you want to use it. Even if you’re going to make it right away, the advantage is that the spices are evenly distributed throughout the oatmeal from the start. Here I’ve added a lot of cinnamon with smaller amounts of ginger, cardamom, and pumpkin pie spice (I was too lazy to grind cloves). Like I said, I like spiced things to taste like they have spices in them. In these photos I’m making a double batch of the oatmeal (I always do, for reasons that will become clear later), and I think this is about as much as I would’ve liked to have used on a single batch. This is what it looks like all shaken up. When I’m eyeballing the spices, I usually go until it’s quite a bit browner than this, but unless you’re like me on the spice thing, this is a good ratio to start with. Everything up until this point can be done beforehand. (If you’re using the coconut flakes, you can also toast them ahead of time for about 2 minutes in a 350 degree oven, making sure only the very edges turn toasty and brown.) When the time comes to make the oatmeal, make sure the first thing you do is to get the water boiling. This saves you time, and worry over burning the oatmeal while you fiddle with your tea or electric kettle. Ginger is the key to this entire recipe. I don’t remember when I first tried it in the oatmeal or why, only that it imparts a flavor to it that I now can’t separate from the taste of steel cut oatmeal. When I get steel cut oatmeal elsewhere, it’s never quite the same, and the crystallized ginger is the key. I have a pinched nerve that causes a lot of pain in my shoulder, which is why I don’t cook professionally anymore. 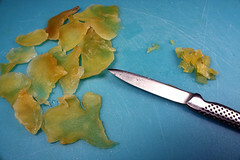 Chopping and slicing hurt it more than just about anything else, especially tough things like crystallized ginger. Only recently did I think of the answer: I put the ginger in a bowl and pour just enough of the boiling water for the oatmeal to cover. After two minutes, the ginger is soft and much easier to dice. (Be careful. It’s also very hot.) Because I count on all of the flavor from the ginger, plus the hint of sweetness from the sugar encrusted on it, I reserve the water it soaked in and use it as part of the water for the oatmeal. Problem solved. Now it’s time to cook the oatmeal. First, melt the butter in your pot over medium heat. (You can get away with using less (or more!) butter, depending on whether you’re going for health or luxury.) While it melts, make sure your water is boiling. Add the spiced oatmeal. Stir well to evenly coat with butter. 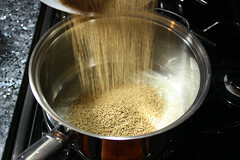 Toast the oatmeal for about two minutes, stirring the whole time to keep it from burning. Add the boiling water. 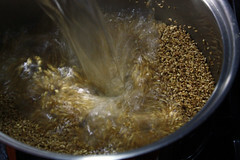 It will bubble dramatically as soon as it hits the bottom of the pot, so beware of flying flecks of hot, wet oatmeal! I got hit by one right at the moment this photo was taken. 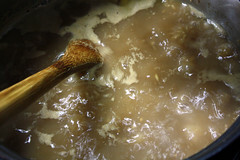 Add the crystallized ginger and stir together, just until everything is mixed, then stop and turn the heat down to low. Because the oatmeal is hot and the water is boiling before they meet, you won’t have to wait for them to come to a boil. Leave it to simmer, uncovered. Set a timer for 25 minutes and don’t touch the oatmeal until it goes off. 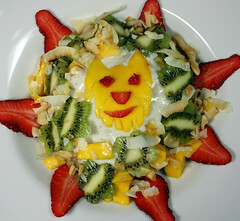 While the oatmeal cooks, you’ll have time to cut up fruit and toast coconut flakes, if you haven’t already. If you have, then make yourself a cup of tea with any excess boiling water and relax. 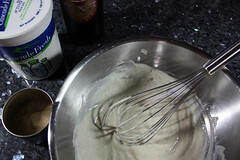 After 25 minutes, add the buttermilk. Once again, stir only long enough to combine. Set the timer again, this time for 10 minutes, and leave it to simmer again, uncovered. If you are making a large batch of oatmeal for a lot of people, and won’t be serving it all at once, you have another option. 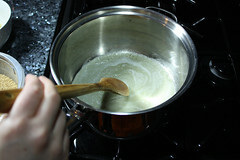 After the timer goes off, rather than adding the buttermilk, just cover the pot and turn off the heat. 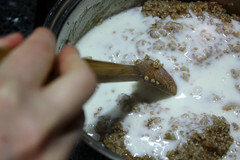 Then, make the oatmeal to order by scooping it into a second, smaller pan, adding a little of the buttermilk and cooking it until it starts to bubble. After the ten minutes have passed, turn off the heat. Give it one last stir–this would be the best time to add that rum, if you’re feeling pirate-y. Serve the oatmeal, topped with the yogurt, fruit and coconut. You know, I’ve been following too many bento blogs lately…sadly, though, I still couldn’t figure out how to give my tiger stripes with the fruit I had on hand. I mentioned above that I always make a double batch of oatmeal, even if I’m eating alone. The reason is that this oatmeal makes fantastic leftovers, something I only figured out a few years ago. This is already getting awfully long, so next time I’ll demonstrate how to do that. I hope you will try out this oatmeal. I still have the same problem I did at the Inn: there really is no way to make it sound as good as it tastes, even if I use every superlative in my arsenal. I never can pick a favorite book or TV show or scene I’ve written for one of my novels–it’s that whole choosing between your babies thing–but this is my number one, super-favorite recipe I’ve ever come up with. I can’t help wanting everyone to taste it. So, what about you? Do you have a personal recipe that you’re more proud of than any other, one that’s special no matter how many times you make it? Sounds really yummy. I love ginger and cardamom. Nice flavors. I’ll give it a try. Oatmeal is so good for you that I’m always open to new ways to prepare it. Thanks for posting and good luck with your blog. Thanks! If you do try it, let me know what you think. I’m glad you like the name…part of the time it took me to get this up was just trying to think of a good domain name. It’s hard to sort of encapsulate my pastry stuff and the vegetarian cooking (not to mention Chris’ sourdough bread posts) in a few characters! But as soon as I thought of this one, it made me giggle, so I thought I’d just go with it. Yes, you do need to give it a whirl! Especially the ginger. It just…works with the oatmeal. I don’t know why. I like the texture it adds, too. great recipe! The cardamom yogurt sounds wonderful and the whole dish looks delicious! Love your new site! Thanks! The yogurt is wonderful. In fact, I’m eating some of that batch of oatmeal now and I’m very sad because I ran out of the yogurt yesterday. That oatmeal looks really good! MMMMMMMM..I love those flavours, I adore them!! I use them in my daily cooking & baking too! I just discovered your website & I love it!!! Many greetings from Brussels, Belgium!!! Wonderful! I love cardamom…and ginger…so you have great taste. 🙂 Thanks for stopping by! What a lovely blog you have and what a good-looking couple you and Chris make! Aw, thanks! Yeah, I wish I’d thought of it myself…I love mango lassis, and the mango and yogurt dish I got the idea from is sort of just a deconstructed mango lassi. I just tried this recipe over the weekend, with a re-run this morning (according to your instructions for freezing and re-heating). What a wonderful, quick breakfast! This is even better as lefovers. I wasted no time in forwarding the recipe and instructions links to my sister. 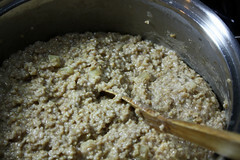 I have no doubt that this steel-cut oatmeal will make regular appearances at my home, along with the cardamom yogurt. (BTW, I ground and sifted the cardamom from pods I already had at home for Indian dishes.) The crystalized ginger is fabulous in the steel-cut oatmeal. I don’t think I would have thought of that, though I love using crystalized ginger in cakes. 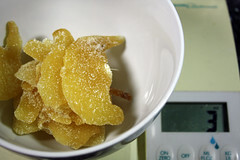 I’m also itching to try the recipe with dried apricots, or perhaps in combination with the ginger.